Ok, so everyone I know (more or less) has raved about their wonder over The Hunger Games , which is a trilogy of books written by Suzanne Collins. Last year it seemed all I heard about was how great these books were and how everyone was wow-ed by them. I was definitely growing increasingly intrigued and wanted to join in on the "I Read It" club. Finally got around to picking up a used copy of the book and dove into it this past month. Here is when I confess to you: I only read the first half. I wanted to state that right up front because I recognize that that disqualifies me from having an opinion on it according to some people. So there's my disclaimer. Regardless of whether or not I'm "allowed" to have a full opinion of it, I do anyway. Suzanne Collins writes in an intriguing manner. She keeps up the suspense and she lays the groundwork for what you know is going to be a wild and intriguing tale. She draws the reader in and hooks them - partly in awe and wonder and partly due to morbid curiosity. 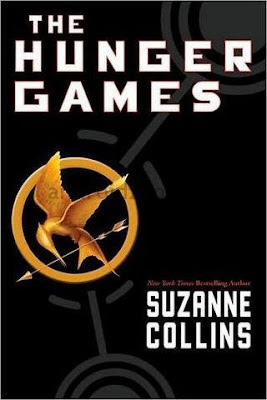 As I mentioned, I read the first half of the book leading up to the start of The Hunger Games, in which past games were discussed and I had a feeling that the games themselves (again, in which the teenagers are required to kill each other off in front of a national television audience) were going to be disturbing. Heck, I was already disturbed by the first half! Just the very idea of sacrificing children by forcing them to kill and mutilate each other as some sick form of entertainment (and enforced slavery) is, in two words, positively disgusting. To say that I was riveted by the first half of the book is an understatement. So is saying that I was in a foul mood after having finished it. Jonathan came home and I went over the plot with him and asked him if he thought I should keep reading it. He suggested I might want to find more happy reading fare, but left it up to me. So I decided at that point to try to find some spoiler reviews to see if I could handle the end results of this book. And I had a hard time finding a spoiler review! (Look at us book bloggers! We're all so good at being courteous in this department!) But I needed to know so eventually I stumbled upon the Focus on the Family review of The Hunger Games and read that. I highly recommend reading their review if you aren't certain what to make of this book! After reading that review, I decided against completing the book. Although Collins skillfully avoids describing the morbidness of past killing games, I wasn't too certain about the actual games themselves. So I checked out the FoF review and then skimmed a few chapters of the games in the last half of the book and felt disturbed by what I found on the pages. The idea of sending children into an arena to kill one another is bothersome. For the same reason, by the way, that abortion is bothersome and difficult to deal with. The idea of mutilating a person just because they haven't been born yet is equally vile and offensive. Killing for the sake of killing is something that rightly sends chills down our spines. It is shocking and horrifying to our sensibilities. It keeps us riveted on the plot in The Hunger Games because we simply cannot believe our eyes or what emotions are being stirred up within us as we read about children being speared by other children or having their necks broken by others. Why would we do this? Why would we shove scissors in the backs of babies necks and think that that is somehow an agreeable or excusable practice? Because the government says so? Because we are ignoring common moral law? Our brains cannot comprehend the cruelty of it but society is telling us it is acceptable. It's "the way things are." We cannot make sense of it. I read (the first half) of The Hunger Games and thought it was scarily accurate as to how little value today's society places on human life. And therefore I was horrified by it. Not because of the shock value, but because of the truth. Quite frankly, reading the book for entertainment was beyond me. It wasn't a fun read. It was captivating. It was intriguing. It was, as I've said, horrifying. But it was not entertaining. It would be as entertaining as watching a few abortions performed live would be, although we might create some fictionalized names "to protect the innocent." I was unable to read it as entertainment but kept thinking about the unfathomable murder of unborn children. If we put them into the arena for The Hunger Games, perhaps we'd be more aware of their plight and eager to take a stand against the injustice of their murders. The book ended up putting me in a very foul mood because of the depravity of it. It was affecting my emotions in a negative way and I didn't feel it beneficial to keep reading it just to say I finished it. I read those quotes and wondered how many people are reading these books as entertainment only or as thought-provoking reads. I trust some readers but the general public worries me as to what they think is just fine, fun and entertaining and what isn't. If you do have young teens (or older teens) who are or want to read this, I would heartily and strongly recommend the parents read the books first. Be prepared to discuss. Plan to discuss. Understand the books and the arguments they are making. Talk about this book's effect on society and society's view of killing for purposes of convenience and entertainment. Do not be lazy about addressing the issues this book raises! I wouldn't say it's a "Don't Read" book. I would say it's a "Do not read for entertainment only purposes" type of book. It DEMANDS attention and diligence in dissecting and discerning and it would be a great mistake to assume less. Again, I heartily recommend and encourage the Focus on the Family review of The Hunger Games. It gives a good overview of the plot, the issues and things to be aware of. Am I glad to have picked it up? Yes. For this reason: I wouldn't want to remain in ignorance of it. However, that doesn't mean I have to complete it. And it doesn't mean I'm going to recommend it. All I'm saying is that I'm glad to be "in the know" to a greater extent - because of its truth. I read The Hunger Games and the second book Catching Fire in one weekend. You are right, Suzanne Collins' writing is very intriguing and addicting. I felt the same things you felt while reading, and it was only after rushing through the two books that I really started to wonder why I read them. Why are they considered entertainment for young kids who are already consumed by "adult" issues through television, the internet, and school. Books, especially for children, are supposed to be gateways to learning, not to immorality and confusion. Besides, I don't agree with the non-Christian principles of the book. I'd never, ever hand this book to anyone under the age of sixteen. It's interesting how people are so intrigued by these books. But I don't think we have to read The Hunger Games to see those principles in action. Look around. We're not too far off from that book's plot. My daughter (7th grade) read the book for a class assignment. She couldn't stop talking about it. (Quite the accomplishment for a non-reader). We gave her the trilogy for Christmas. I will be reading them along with her, so we can discuss. I figure at least if she's going to be exposed to certain things, I should be able to have open & honest discussions with her about them. Melissa- Yup! That's absolutely the way to go. Like I said, I really don't have a problem with them being read. I actually think the read could be beneficial. But there would have to be a LOT of discussion surrounding it. Although I do prefer for an older audience to be dealing with the topics - the younger can be taught discernment just as well. I've heard this book raved about, as you have, and can't figure out for the life of me why it would appeal to anyone. I haven't read it and don't intend to, and your review further solidifies that resolve. If one of my sons was interested in it I might read it just to be in the know and able to discuss it with them, but I don't think it is on their radar. Today, just today, I read all of your spoilers. Thank you, Carrie for spoilers and quite the review! I don't think I'll be reading. I read the first chapter a while back. It seemed so dark to me that I turned it back in (to the library) thinking that I might read it in the future. I still might, but like you, I don't really think it is a book to be enjoyed. Thanks for your review! Oh these are some of my favorite books. Yes it's horrific, but Collins does a great job, as you said, of not descending to the very culture she's critiquing. Also, there's just so so so much more going on in these books than what's on the surface. As mindless entertainment? No these don't work. As powerful, thought provoking, heart stirring examinations of culture? Yes they do. I really enjoyed reading your thoughts. I read the whole series, but only the second one really drew me in. I found that they were not nourishing in ways I needed. It really is interesting, the things early-teen-aged kids are offered to read. So much dark, dystopian fare. When I was in 8th grade, it was 'The Lottery' and 'The Most Dangerous Game.' Then came '1984.' I often wonder if the general difficulty and insecurity I felt about growing up back then had something to do with the required reading. It's not that books like these don't make us think about important things. It's that they're better thought about after we've gained more life experience and have a better, more formed standard for comparison. Your recommendation that parents should be prepared to read and discuss such stories with their kids is right on! I just read this book last week, and I rather enjoyed it. But I enjoyed it as a critique of our society, not as pure entertainment. However, I'm going to have to respectfully disagree with your correlation of the Hunger Games with abortion. I don't think it's a fair parallel to make, and I disagree that the violence of the Games and the act of abortion are at all the same. While I agree with you that parents should talk about this book with their kids, I disagree that the book is inappropriate for its intended audience. We can't shelter kids from the world - and, particularly, from intellectually critiquing society and societal values - until they're considered "adults". Rather than saying that this book is too "adult" for kids, I would argue that our kids can understand and learn from a lot of things that we don't give them credit for. We can't let our kids watch violent television or movies on the one hand, and ban them from reading books like this - that actually teach them things! - on the other. Anyways, I'm not trying to tear down your thoughts, I just wanted to respond to them. I think they're valid, but like I said before ... I disagree. I agree with a lot of what you said. I read it last week and posted a review with similar sentiments. (Though not as articulate or thorough.) I feel that it could lead to some good conversation, but I'm frankly not in a place that I want to dissect it for that, and my kids are no where near reading it. :) I do agree with the age issue - I talk to a lot of young teenagers who have no clue the issues that really lie below the surface. The fact that they enjoy these so much is very disturbing to me. Thank you for this review. I've been told I MUST read these books, but was rather hesitant to, considering the subject matter. This confirms my doubts that I should read it. It would consume me, and that would not be good. Amy (My Friend) - Yes. I think I do agree with you and what you said. There IS so much going on beneath the surface of the books. That's why they cannot be just mindless entertainment. As a thought-provoking read that involves much discussion, I would like them quite well. Maybe even I DO like them quite well - for that purpose. So yes, Janet, I agree with you in saying that these books are not to be avoided - but they are better understood with age, maturity, wisdom and greater perspective. This is why I do not agree with Carina. It would take one amazing teen to be able to dissect and discern what this book represents, what it argues for and against, and to be able to deal with the ideas involved. I would personally give it to my own child - at the age of 16. And I would read it with them. And I would talk about it. A lot. In detail. In depth. I would want them to understand it and the effects that it has had on society. I hear about a lot of teens who like this book. I don't hear *why* - other than the plot just being intriguing which I cannot disagree with. But for what other reasons? What are they discerning from this? That gives me pause. I agree that we much teach our children to be discerning. And I also think we must be respecters of age and maturity levels. I do not think innocence must be stripped away the moment our children are born. We build them up, teaching and instructing them from birth how to develop their thoughts, how to perceive the world around them, we offer safe guidance and counsel and encouragement as they stretch their own wings and learn to fly on their own. I do not dump the concept of murder on my four year old for example. He is not ready for it. He is becoming ready to talk about death. So we start there and we work our way up. Yes, society WILL try to educate my child faster than I will in certain areas. I will not leave my child UNeducated. Rather, I would pace my child, protecting them so that when they have to deal with darker topics, they are very well prepared to do so - with success!! Without causing them grief. Without throwing them into things before they are ready to deal with them. Again, I think we have to respect age and maturity. There are lots of things I look forward to sharing with my children that they are just not ready for yet. And I am opposed to handing over The Hunger Games to 11 and 12 year olds. I highly doubt their ability to articulate the arguments Collins raises and their ability to discuss it in a mature manner. Not saying it isn't possible. Just saying it's not likely. As for abortion - well, we're desensitized to that, are we not? As a society we accept it, talk about it as the norm, and generally support it. The society in The Hunger Games also accepts murder. They have been desensitized. Murder it normal. People watch it. They fear it and dislike discussing the details, but it's still happening - right before their eyes. And they are not rising up to stop it. They just find reasons to argue that is somehow justifiable or that it's something that they just have to learn to accept. But with extreme exceptions, murder is never justifiable and always has a consequence. The question is - what is it? And what is the consequence of this book? This series will have influence and an effect. That's why I think we should read it - AND talk about it. My cousin (an adult) just finished the trilogy and commented that she couldn't believe I liked them. Hmmm. I suppose it is somewhat out of character for me (although I'm not sure "character" is the right word), but I will confess to an affinity for dystopian novels that might explain my enjoyment. Like Janet, I was exposed to similarly themed short stories as a teen: "The Lottery," "Most Dangerous Game," and the like. Like it or not, I guess, kids are exposed to these ideas. I DO think it's important for parents to read and discuss with their children. Absolutely. I'm sort of out of the mainstream (mostly by choice) in that I watch no television at all and very few current movies (maybe 3 new movies a year). However, the devaluing of human life is a plot device/theme/what have you that kids nowadays are exposed to, I think. I'm rambling, aren't I? Sheesh. I liked the trilogy and I *think* I wouldn't have a problem letting my mature teen (if I had one, which makes this really easy to say) read it. Of course, that would be tempered with LOTS of discussion. Okay, I've gone back and re-read your review more closely, and I think I agree with you, although I confess to enjoying (maybe not the right word, but I can't think of a better one) the ride. However, and this is a HUGE however, I was reading it as more of a commentary on our society, with its terrible penchant for entertainment at the price of everything else. I think this book would be great as a book for mature teens to read alongside Fahrenheit 451 or the like. Discussion is a must. It IS an intriguing read from the standpoint of where society is at. Yup, yup. And not on topic with your comment, but back to the idea of my concern that this book is being picked up by tweens and teens merely as entertainment - obviously Hollywood sees something in that as they are making a movie out of it. Why? To make money. To entertain. They really do'nt care so much about making people *think. * Fads and dollars rule tend to rule the day. And how on earth is this book to be turned into a film that is anything less than R!? I can't see it. (But then, I don't really want to see it.) It's concerning. Okay, I haven't signed off yet. :-) Don't you think this is one of the real reasons that literature is so important--to make us stop and look at the world we live in? I agree that Hollywood probably won't (might not?) do it justice, and like you, I probably won't watch the movie anyway. I ABHOR violence, especially when it comes to a visual representation. Good thoughts! I read the Hunger Games trilogy and loved it - but not because it was entertaining or "fun". I loved it because of how accurate it was in depicting society's increasing decline and disregard of human life. Definitely makes you think hard about tough, disturbing issues. Oh, and I noticed your question about how the book could be turned into a movie rated anything less than R. I agree. Hollywood will either try to squeeze past with a PG-13 (and forgo most of the gore), or they will settle for the real punch. At any rate, if the movie is true to the book, it will certainly be disturbing. Very disturbing. Oh, I'm glad you wrote this. I've heard nothing but rave reviews of these books and since I have a feeling we are very similar I'm glad to know I won't enjoy these. I actually just asked my husband if he'd read them and he said no, but another friend of ours had and he didn't like them. Based on his reasoning my husband is pretty sure I wouldn't like them and I can see why. If you want something like this to discuss with a son or daughter I highly recommend The Giver by Lois Lowry (or many of her other books). It sounds like a similar theme, but without all the gore. I read it in high school and it is on my all time list of favorite books. Carrie, I second the above recommendation of Lowry's The Giver, if you haven't read it, as well as some of her other dystopian novels, if you haven't read them. I enjoy your reviews but normally have little time to comment. I agree with your assessment about this book. My older teens read the trilogy and so did I and we discussed it and discussed it. It should not be for entertainment, I completely agree with you. But it was a great trilogy to read alongside our school discussions on government. I've recommended to friends who have asked that 15yo would be the youngest age for those and preferably 16yo and up. These aren't for children. I also agree that they are horrifying and captivating at the same time. I found myself continually disturbed at how captivated I was by the horror of them and although I had not made a connection with abortion, I can see why you would make that connection, at least in the first book. Haven't read the Giver so I'll have to pick it up. (I've almost picked it up a time or two based on the number of times I've heard it referenced, but now I'll definitely do so next time I see it.) Thanks for the tip! 1) I found it interesting and convicting to note how disturbed you were by the books. I read them and thought I was 'horrified' but it was more in an intellectual sense, not a gut-wrenching horror as it seemed to have affected you. It makes me wonder how differently my children will view book choices as we have preread their reading choices and they haven't been exposed to anything close the the junk I grew up reading (shudder). 2) I have to admit I thoroughly enjoyed these books. While her writing was engaging, I don't think they are well-written enough to stand the test of time. But I enjoyed reading the series, as I mentioned previously, because it made me think of classic literature like The Lottery, The Most Dangerous Game, and The Giver (and I'm not surprised to see so many other commenters also referring to these pieces of literature). I found the series very thought-provoking and I enjoy thinking like that. However, I was convicted by your reference to seeing them merely as thought-provoking reads. Thanks for making me self-evaluate. 3) The writers who endorse the book. . .hmmm, interesting and giving me pause. . .
4) My 13 yos and 15 yod have not read these books. I have planned on having them read them (they've read The Giver as well as two other Lowry dystopian books and The Lottery, but not The Most Dangerous Game) and discuss them from the perspectives of a) how classic literature affects modern writers and b) worldview, standing up for what's right regardless of what others are doing, governmental decisions, etc. I think we may wait a couple years on that yet. . . There is something to be said for reading a post the day after it was written. I returned today to read comments and was shocked at all the talk. Great conversation. Thank you for articulating your thoughts so well. You are a writer and reviewer like many of us want to be. To read or not to read (your review) was the question I battled with when I saw the spoiler alert. I'm so glad I chose to read. I've had quite a few people I appreciate recommend this book to me, but apart from the vague "dystopian novel" description, I've had no idea what it's about. I think I'll probably still read it--if only to be able to talk about it with those friends who have read it--but this way I'll be a little more prepared for what I might find within. I have never read the hunger games maybe I should add it to my list of must reads? I do have it on my recommended reads list, but only for high schoolers on up. I think that it is a great jumping off point for discussions about entertainment and human life. How can people not like the book it's a little gory, but what isn't these days. Personally it is one of my favorite books. P.S. i read this book for pure entertainment. you are not "in the know".... because you did not finish the book. If you had, you would be able to give susan credit for showing Katniss' clever ability to survive a horrible situation. By giving us Katniss' view, Susan did not make it a gory bloodbath for the reader to watch even though the over all situation was a gory bloodbath. Sad that you would not finish a book but say you are "in the know". If you had finished it and still said you didn't like it for the same reasons or even say you though it was gory for the reader, I would respect you so much more. Hello I would really like to express my opinion not only to you Carrie but also to many of you who are commenting, when both of you, honestly, have no idea what your writing about. But first of all, I would like to say that I am 13 years old (12 when I first read trilogy), I am chrisitan, I am very mature for my age, and I am intellectually gifted. Also to say that, I ENJOYED this book! Yes, I said it! I truly enjoyed this book, so much that I have read the entire trilogy over again at least 6 possibly 8 times. Now to start off, I would really like to say that this book is really not all that gruesome nor does it focus on the murder of these children. Collins does a masterful job of not going to far into them, and certainly does not fill the novel with them. The Hunger Games is so much more than that. If you go deeper into it, you find much more. Action, suspense, survival, loss, romance, and yes, even some happines that will make you smile. So those that say that this book or even trilogy focuses just on the gore, are wrong. I found heaps more in these books, and while the deaths do somewhat have that uneasy effect on you, I only helps you understand the leading character better. Plus, those deaths are supposed to make hate the rulers of the Capitol, just like so many characters in this wonderful piece of art do. Onto the next thing that really made me angry. The fact that so many of you believe that almost all of you believe that everysingle citizen of Panem is desensitized to these deaths or at least unwilling to do anything about them. This is 100% not true. Really, the Capitol citizens are the ones that have really been desensitized to these deaths and find the games as the ultament entertainment. However, I think that even then that not all of the Capitol citizens enjoy the Games. I think that there is a substantial amount that have unrest and find disgust in the Games. And then, in the districts, all of the citizens despise the Games and the Capitol for what it has done to them and how them have made their lives be like. Though this hatred has varying levels in different districts, it's still there. Also, it's not quite that they don't do anything about it. It's that they have so much fear that they can't even think about doing something. This is how the Capitol controlled the nation, through fear brought by the Hunger Games. They are saying mess with us, and we will kill your children in the most inhumane way possible. And if you did stop acting like you don't read it because you don't think it is "appropriate", you would find that they do rebel and win. It just shows that if you just read the trilogy, and saw the phenomenal message, you would enjoy it. So my message to you is to read it. You will like it, if not love it. So please, stop being pansys because we see much worse on the news. So just shut up, read the book, and don't trust those reviews of those who don't even complete the book!!!! And Carrie, I suggest you complete a book and the series before you review. So farewell, to all you despicable excuses for 'well literate' persons, for I am way too busy to spend too much time on this horrible website. Well, I certainly wouldn't want to ignore the opportunity to bow to the wisdom of the 13 year old Mr. Hollister. I'm going to leave his comment (and comment on it) because I find it amusing as a thirty-something year old. I'll just say this for clarification purposes, and because impertinence and impatience got in the way of understanding what I was saying. I didn't say that the books shouldn't be read. I said that I read enough to know that they shouldn't be read for entertainment purposes. I think that they do have value in a discussion about worldview and society at large. I think the subject matter to be heady enough to warrant a mature audience so that they can properly understand what they are dealing with. But I did not, at any point, suggest that the books should not be read. I think, Mr. Hollister, since you are speaking without love by admission, I'll probably delete any future comments you have to make unless you clean up your remarks a bit. My policy, as I have stated around these parts before, is that I am happy to leave negative comments provided they are not offensive to myself or my readers. I think a line has been crossed here but I'll leave this one. In love, of course. If Mr. Hollister wants to return, I just want to tell him that my daughter also read all 3 books when she was 12 (maybe started at 11), and is also an intellectually gifted Christian. She liked them. I (her gifted 40-year-old Christian mom) liked them too. Carrie didn't like them, and that's her opinion, though I still like her. And Carrie -- I hadn't read some of your follow-up comments, so I'll follow up on them now. I will say that I think that Amanda likes them for the same reason I do -- just for pure imaginary entertainment. I don't think it dulls sensitivity to such topics -- if anything it points out the horror of it (especially as you continue in the trilogy). Oh Carrie, not to be offensive of course, but did I ever say that you said 'do not to read this book'? No. It was not just addressed to yourself, but also to all of those who had written it off in their comments (not everyone who commented, because I did agree with a few) and of course those who would be reading my comment (not saying that everyone who would read it had certain opinions). Now I do agree that I did step out of line and I am sorry for that. And I don't like your mocking tone. I honestly do not think that was needed. But I won't go too far into that subject. Also I don't believe that I was had "impertinence and impatience". Maybe impatience. I certainly wasn't happy about being negative and really just wanted to be done with it, but I would rather have said it, than not have said anything at all. Another thing is that, I wasn't planning on coming back and writing a comment, but I really did not have much else to do. Plus I didn't want to go down without getting out at least one more comment. Now I am so sorry but I must go, but I do hope I did clarify somethings and I do hope you don't delete this because I will just re-post post it again and again. Determination.